Organic Amaranth Flour is 100% stone ground and gluten free. It can be used to replace 25% of the flour in your own recipes and is great for gluten free baking when combined with another non-grain flour or starch. Amaranth is a gluten-free food as well as a source of complete protein and contains all the essential amino acids, including lysine, which is lacking in most grains. High in fiber and a good source of magnesium and iron, Gluten Free Amaranth Flour is a spectacular addition to your diet. This little powerhouse is perfect for gluten free and vegan diets. 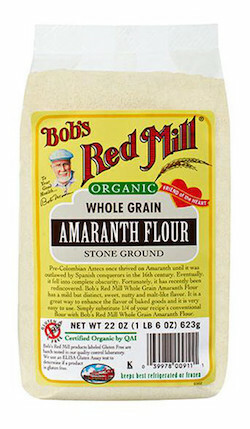 Bob's Red Mill Whole Grain Amaranth Flour has a mild but distinct, slightly sweet, nutty, earthy and malt-like flavor. It's a great way to enhance the flavor of baked goods, and it's very easy to use. Simply substitute 1/4 of your recipe's conventional flour with Bob's Red Mill Whole Grain Amaranth Flour.